"Approximately 20 Native Alaskan people have vanished or died under questionable circumstances in the Nome area since the 1960s. Authorites opened a probe into their deaths and disappearances, but they do not believe a serial predator was involved." Nome is probably a pretty hazardous place to live, but it seems to be overrepresented among Alaskan towns in terms of missing persons reports. 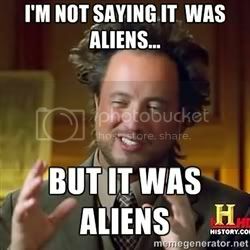 I tried Google searching and a lot of the results were about alien abductions...call me crazy, but I think there's a different explanation. Do any Nome natives have any possible answers about this? Could it just be a coincidence? It sure seems strange that such a small town would have so many of these cases, let alone with all the people involved being Native Alaskan. Damn you all for beating me to posting that!!! In reality the OP asked a serious question. Then there is a movie that show illegal aliens from another planet doing things like that around Nome (based on a real story about one of the disappearances). That said, in Alaska there always are people missing. Some get lost and never found, some go out there hoping to find people who are lost, and become lost themselves. So in 50 years 20 people have died or went missing in Nome? That's not that many. I wonder if anyone has posted the results of how many people have driven a snow machine into a hole on the river ice and have never been found? Or the case of Dr. Kenneth Hunter who was convicted of murder in Egegik even though no bodies or remains were ever located? Lots of people go missing in Alaska every year and are never seen again. I wonder if the Anjikuni Mystery in Nunavut Canada is related? Everybody in the village vanished, supposedly. The reality of the situation is that in the dead of winter with alcohol involved, people are likely to go missing. At least, that was the finding of the FBI investigation from what I've read.